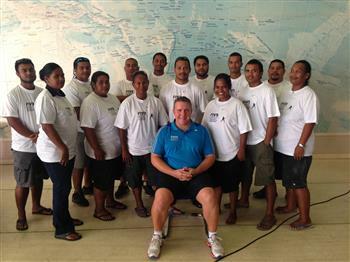 I have been receiving news of Alexis Lebedew’s visit to Nauru. I really like the way Alexis writes and I have found his six part journal, about delivering a coaching course, compelling reading. I have to admit I found Nauru time in equal parts frustrating and entertaining. But in the end I just planned around it. An Australian I met here described it most eloquently. He said that in Australia, time is always moving away from you. In Nauru, the locals always think that time is coming towards you. That is, in Australia you always have to do things before you run out of time, but in Nauru you can always do them later because the time to do them is coming up. time is not found in dead clocks and inert calendars, time is not money but is life itself: in ocean tides and the blood in the womb, in every self-respecting player, in the land, in every spirited protest for diversity and every refusal to let another enslave your time, in the effervescent gusto of carnival; life revelling in rebellion against the clock. I have been contemplating how this sense of time might help develop my approach to open and shared learning. Amongst many peoples, ‘Time’ is a matter of timing . It involves spontaneity rather than scheduling, sensitivity to a quality of time. Unclockable. … Timing for many indigenous peoples… is variable and indeterminate and unpredictable. Time is a subtle element where creativity and improvisation, flexibility, fluidity and responsiveness can flourish. 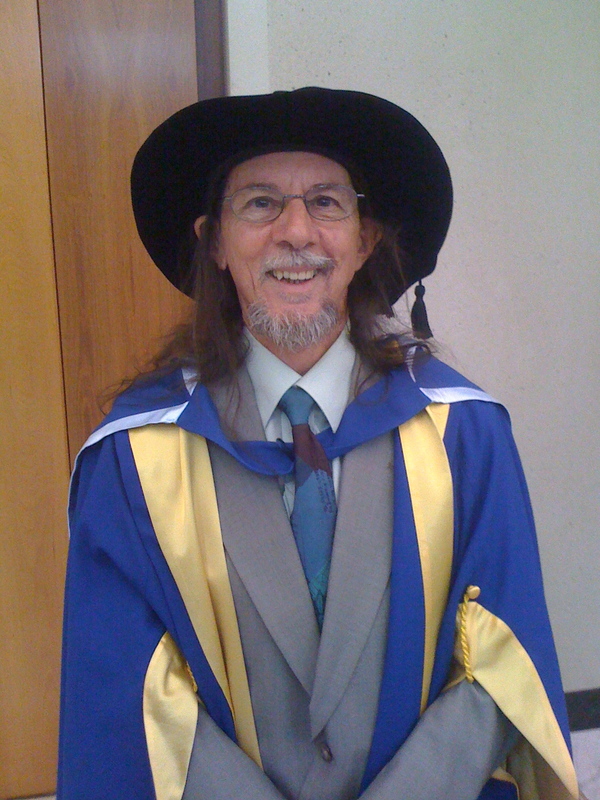 Dennis Bryant was awarded his PhD this morning at the University of Canberra’s Graduation Ceremony in the Great Hall of Parliament. Dennis’s thesis was titled Students and Their Learning Journeys: A Study of Failure in an Australian University. This thesis explores students’ learning journeys in and through units in Higher Education degree courses. The exploration focuses specifically on student learning failure. It does so by using empirical evidence from one Australian university over a two-year period. The argument presented here is that universities can exploit detailed data at their disposal to enhance students’ achievements on their learning journeys. An information-rich but modest Toolkit is proposed that provides a detailed description of student learning journeys in general, and of failure in particular. The Toolkit comprises an individual student’s current achievement in a unit (Grade); an individual student’s previous semester achievement (Grade Point Average); three failing Categories, namely, Academically Weak, Not Engaged or Speed Bump and two passing Categories, namely, Passing OK or Flagging, into one of which each individual student is assigned after encountering a unit; and the Group Learning Attainment of all students in that unit (an average of all Grades in a unit). The final Toolkit element concerns Dimensions of responsibility for learning. The Dimensions are Student, University, Course and Lecturer. This thesis suggests that student academic learning failure is an interrelationship of these four Dimensions. An argument is presented that the three non-Student Dimensions can impact negatively on student learning journeys, and are likely to contribute to failure. Notwithstanding these issues, the thesis concludes that it is possible to support and enhance student learning achievement journeys. 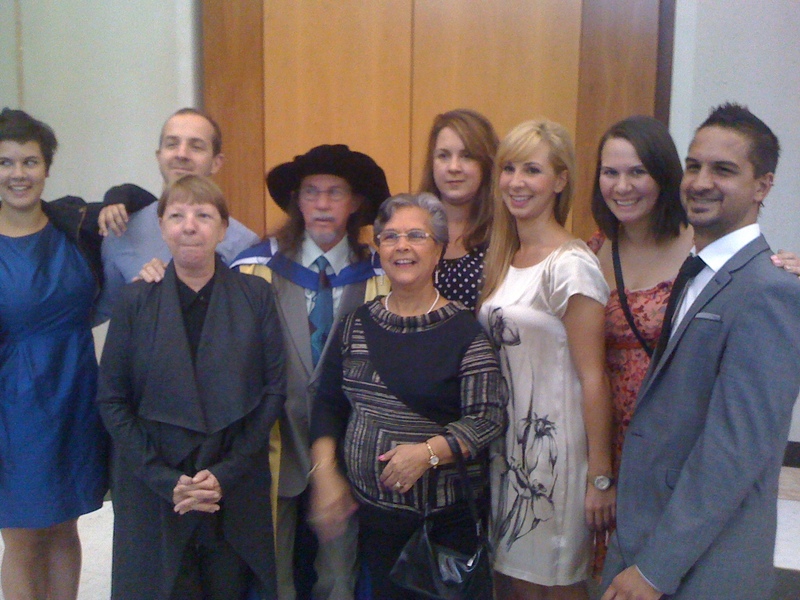 I was delighted to be able to attend the ceremony and see Dennis receive his PhD. I felt part of his family. I am hopeful that Dennis and I might be able to extend our work. I do think it has immense significance for personalising learning opportunities in education and sport.